Holly Park Meat Packers, Inc.
Holly Park Meat Packers Inc., is a privately-owned meat processing company headquartered in Cookstown, Canada. The company specializes in processing beef, lamb, veal and bacon. 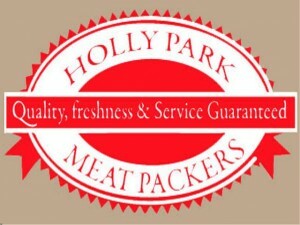 Holly Park Meat Packers was founded in 1979. Since its inception, the company has been engaged in meat processing and has focused its operations on meats such as veal, lamb and beef. The company’s main mission is to be able to give the best possible service in order for its customers to be happy. Holly Park Meat Packers has its headquarters in Cookstown, Canada. Its meat processing facility is federally inspected, assuring customers that its operations and products are safe. Aside from its meat processing facility in Cookstown, the company also has its own farm and slaughterhouse. The company’s farm is located in Rockwood, Ontario and its slaughterhouse is located in Bolton, Ontario. The primary supply of meat comes from the farm, with additional supply coming from other producers. Having a farm, a slaughterhouse and a processing facility enables Holly Park Meat Packers to implement traceability. With this, the company is able to follow and monitor the process every step of the way, from the animals harvested at the farm to where the final product is produced. Holly Park’s products have also been recognized for their premium quality. In February of 2009, the company’s Phoenix bacon was given a silver award for its excellent quality at the yearly conference of The Ontario Independent Meat Producers. Holly Park’s bacon came out as the winner among over a hundred premium poultry and meat products that were nominated. The company’s bacon product proved to be excellent in the categories of visual appeal, uniqueness, flavor, aroma, consumer appeal, appearance and texture. In April of 2010, an investment of $1.5 million from the Canadian Government’s Slaughter Improvement Program allowed Holly Park Meat Packers to improve the company’s operations that will ultimately result in the industry becoming more profitable. Currently, Holly Park Meat Packers is considered the biggest provincially inspected meat processing plant in Ontario. It has one hundred employees working at its facilities, making sure that the facilities run smoothly all the time. we are looking for a supplier of halal beef .. specifically boneless from shoulder ..